Stonebrook Equestrian Center is a full service private boarding facility that also offers training for clients who are interested in pursuing the sport of dressage. We pride ourselves in taking excellent care of both our 4-legged and 2-legged clients! We provide a clean, safe, friendly, and supportive atmosphere where you can enjoy spending time with your horse and enjoy the people who surround you. Whether you own a trail horse or are a competitive FEI rider, you will find what you need here to pursue your passion! Includes 2 feedings of high quality hay and grain to maintain your horse’s optimal weight. We are happy to add any supplements you would like to provide and can add them to either the AM/PM or both feedings. PM concentrate followed by turnout. hay if no turnout and and hay at night check if PM ration is finished. Premium board includes a specially balanced diet formulated by a nutritional support company that ensures all of your horses nutritional needs are met for their weight, breed, age, level of work, and metabolism. Horses will be provided free choice hay at all times while in their stall and any supplements needed to balance the diet will be provided by our facility. Adjustments will be made to accommodate horses with special needs (i.e. age, cushings, IR, etc.) Other than medically prescribed substances, the only supplementation your horse should need on this program is a Joint Supplement of your choice. Many owners find that even with the slightly higher board rate, they save money by not having to purchase supplements on their own. *Boarders wishing to participate in this program will need to provide a high quality slow feed hay bag that holds a minimum of 15 lbs of hay. Hay nets may not be used. We are happy to provide you with a list of companies that produce the types of hay bags that are appropriate for this system. ​Elite Board provides our clients with a nutritionally proven, revolutionary feed program that optimizes your horse’s health and wellbeing. This program is designed to mimic the natural conditions in which horses were meant to consume their rations while meeting or exceeding nutritional needs. This diet eliminates grain from the ration and instead provides various sources of high quality fiber which the horse’s digestive tract was designed to digest. Horses will have continuous access to small amounts of their ration at all times creating an ideal environment for the gut and helping minimize and even eliminate ulcer and hindgut irritation common in working and competition horses. Owners no longer need to worry about working around “feeding times” when they want to ride their horse or about their horse’s stomach being empty at any time. Our current clients with horses on this program have found phenomenal changes. Horses move and train better, they are happier and less anxious, many vices disappear, and owners are able to eliminate most, and in some cases all, of their supplements not related to joints. Our specially formulated balanced diet includes a unique combination of forages that our horses thrive on. As a price comparison, the difference between our Elite and basic programs is $150. One month of hindgut supplementation from Succeed is almost $100 and only helps to treat symptoms. Our program is designed to eliminate the problem! You will not be disappointed when you see the results from this program! * Boarders wishing to participate in this program will need to provide a high quality slow feed hay bag that holds a minimum of 15 lbs of hay. Hay nets may not be used. * Boarders will also need to provide a slow feeder proven to work with our system and many others. It is vital that these items belong to you. They are portable and should go with your horse whenever he travels so that his program remains unchanged. Whether you are traveling, showing, or trailriding, your horse will remain happy and healthy. ​We are quite blessed here at Stonebrook to have access to a variety of riding venues. We have a regulation outdoor Dresssage arena surrounded by beautiful pastures and woods. Our 200 x 70 foot Covered arena is a welcome addition to ride out of the elements or when the footing outside is too wet or dry. We also have a bridle path around the property and even a long driveway with wide shoulders and lots of hills for variety. ​During the very wet, wet, wet summer and winter of 2013, we realized that many of our horse friends were unable to ride and continue their training. So, we decided to open our doors and allow courteous riders to use our facility when they could not use their own. 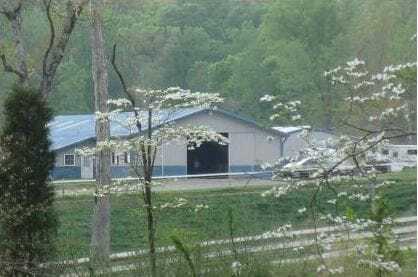 So whether you need to get out of the rain, practice some new moves in front of the mirrors, or just take your horse and school them at a new place before a show, please feel welcome to contact us about our Facility Passes and availability. Our passes give you access to both of our arenas, bridle path, road hacks and hill work, a full set of jumps, and our grooming bays and wash stall. One Day Pass: $15 per horse. Steady Eddy Pass: $50 for 4 visits per month. This pass allows for weekly visits though the month for those who like to maintain a regular schedule. The 4 visits can be used consecutively when weather prohibits the use of your own facility. Frequent Rider Pass: $100 for 10 visits per month. For the serious rider who does not have access to the facilities they need to pursue their goals. Additional passes can be added onto this pass once it is purchased at the discounted rate of $10/visit. For owners who need to board their horse for a period of less than one month, depending on availability, we do offer short term boarding at the rate of $35/day. This will give owners full access to our facilities and amenities for the duration they are here. An excellent opportunity to stay for a week of training or to stay until the weather improves. Claudia is available for lessons both at Stonebrook and at your own Facility. We currently do not have any lesson horses available, but that changes from time to time, so please feel free to contact us for availability. Lesson Package: $400/month pre-paid. This lesson package includes 2 lessons a week on your own horse. Additional lessons can be added on at the reduced rate of $50/lesson. Offsite Lessons: Off-site lessons are available in the surrounding area for $75. Depending on the distance, a $15 travel fee may apply. This fee will be waived for 3 or more rides at the same location. We accept horses in full and partial training and are happy to discuss a plan that will best suit the needs of you and your horse. Fulfill your goals, but most importantly, enjoy the journey! This plan is focused towards the training of the horse on a daily basis throughout the week. Two lessons a week with the rider are included in this package and addition lessons can be exchanged for rides for an additional $10/session. This plan allows both the trainer and the student valuable time with the horse. Students who would like more independence to work on their own while continuing to have their horse tuned up and take lessons will thrive on this program. It includes 2 training rides and 1 lesson a week. Additional lessons may be exchanged for rides for $10/each. Similar advantages to our 3 day a week program with more autonomy. This package consists of one training ride and a lesson or two training rides. Claudia is an “L” graduate with distinction and has 15 years of judging schooling shows. She is an accurate but supportive judge who enjoys giving positive comments that can truly aide the rider with training and score improvement. She has judged shows from Tennessee to the Outer Banks of North Carolina. Her Rate is $250/day plus mileage and expenses. Claudia is an excellent clinician who focuses on the basics of dressage to help her students achieve success. Concepts such as body position, straightness, clarity of aids, positive tension, and proper use of the leg, are many times overlooked by riders as they strive for the perfect angle in a shoulder-in or reaching “X” in a leg yield. Claudia quickly focuses in on where a rider is struggling and helps them gain a better understanding of how movements should be ridden and why. Typically, riders realize they were working too hard or using conflicting aids and once they learn to ask the correct way, she frequently hears, “well that was a whole lot easier!” Clinic rates are $500 per day plus expenses for 8 individual lessons. We are happy to assist in the sale of your horse and provide an ideal environment to present them to potential buyers. We are conveniently located 20 mins from the Charlotte International Airport and have two excellent hotels in Belmont only 5 minutes away from our facility. Potential buyers can enjoy the quaint downtown with some excellent restaurants if they choose to stay overnight to try the horse more than once. We can present horses rain or shine with our covered arena and excellent footing. We have experience with weanlings thru FEI horses and all sales horses will be in training until sold. We pride ourselves in being very honest and descriptive about the horses we sell so buyers feel their trip was worthwhile. This is crucial aspect of selling a horse, as buyers will typically travel many expensive miles and want to see the horse they expected to see. Sellers will be responsible for the expenses of the horse while it is with us and a 10% commission on the sales price once the horse is sold. Buying and selling horses can be very time consuming, emotional, and confusing. Let us handle all the details from marketing, showing, vetting, negotiating, and shipping. We will find your horse a perfect match. *Special considerations or opportunities maybe available for breeders or owners with multiple horses for sale. Please contact us for more details. Are you looking for the perfect horse? We may be able to help. With contacts across the United States and in Europe, that perfect horse might be just around the corner for you. Claudia can help you locate multiple horses in the same region that fit your needs to try to minimize time and costs. She is available to go with you on your trip so you have a professional opinion about what you are looking at. She can also go a day or two ahead of time and narrow down the choices so you do not waste your time looking at unsuitable horses. For riders whose time is of the utmost importance, this can be a very valuable service. Please contact Claudia directly to discuss options. Claudia is available to show horses in training at schooling or rated shows. She is also available to coach you on your horse at shows. *There is no additional charge to show a horse in full training. Owner will cover all expenses. *Coaching at shows that Claudia is already attending is $50/day. *Students who are in training with Claudia will not be charged a coaching fee at shows but will split expenses and cover her costs. Rehabilitation: We have a successful rehab program for horses recovering from injuries. Our rehabilitation package includes full board. We will follow the directions and work closely with the veterinarian to get your horse back under saddle as quickly and safely as possible. The list below includes examples of some of the services that have been provided for horses on rehab. Increased progression of timed workout sets until the horse is back to full work. Medicated shampoos that need to sit for a period of time. Colored or whitening shampoos that need to sit for time. Clipping for shows – face, ears, legs, guard hairs, tail trimming. Tack and Equipment Cleaning: Our staff can also help you with your tack and equipment. Clean and condition other leather goods such as sides reins, etc. Please check our tack room for a current price list for Grooming and Cleaning services.